After seven months of non-operating, Virunga national park is yet to be reopened for tourists. The world’s oldest national park was closed in June 2018 owing to the increased insecurity fears especially in the eastern province of Congo. The latest incident that led to the closure of gorilla-watching tours in Congo was the kidnap of travelers and the killing of the national park ranger who was guiding the clients. The need to revise new strategies for promote security in the park was the major reason why Virunga park was closed. The confirmed date for the reopening of the park is 15th February 2019 and was announced by Hans Van der Stock, the product manager of Live to Travel. At present, Virunga national park is under the leadership of the Belgian Emmanuel de Merode. The news to re open Virunga national park for tourism was greatly welcomed by tour operators and hotel owners in Congo whose business has been on halt since the closure of the national park. 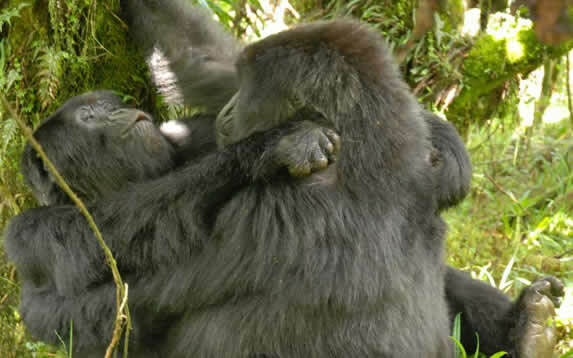 Travelers to see mountain gorillas in Congo can also Kahuzi Biega national park for eastern lowland gorillas. Virunga national park is one of the UNESCO world heritage sites, which shelter a third of the world’s mountain gorillas. The park covers the Congo’s share of the Virunga conservation area bordered by Mgahinga gorilla national park in Uganda and Volcanoes national park in Rwanda. Virunga Park was established in 1925 spreading over 8,000 square kilometers and is Africa’s oldest national park. As said already, Virunga national park is a home to 8 gorilla groups for trekking. All these families have gone through the training process and are familiar with human presence. The Congo gorilla families are Rugendo family, Munyaga gorilla family, Kabirizi gorilla family, Humba gorilla family, Lulengo family, Mapuwa gorilla family, Nyakamwe gorilla family and Bageni gorilla family. Each family is visited by a group of eight people a day for an hour. If you are planning a travel trip to Democratic Republic of Congo, we bring you detailed travel tips to ensure safety stay in Congo. First of all, travelers are reminded to be fully responsible for them selves and their properties while in Congo. Travelers must mind the people they talk to, places they visit and at what time they move around. Travelers are also advised to carry local currency to ease transactions in shopping and public transportation among others. Besides Congo, mountain gorillas live in the jungles of Uganda and Rwanda. In Uganda, gorillas are seen in Bwindi Impenetrable forest national park and Mgahinga gorilla national park while in Rwanda, gorillas are trekked in Volcanoes National park. Last year, Rwanda increased the cost of gorilla permits from $750 to $1500, which affected Rwanda gorilla safaris. Today, Uganda is a focus for most gorilla trips receiving the highest number of travelers. The introduction of Rwanda Uganda gorilla tours staring from Kigali airport crossing over through Cyanika/katuna border to Uganda. Travelers on a 1 day gorilla tour in Uganda leave Kigali at 4:00am to catch u with gorilla trekking briefing in Uganda at 7:00am. In general, the reopening of Virunga national park is good news for Congo’s tourism industry. Travelers can now book gorilla safaris to Virunga and hike Nyiragongo volcano for a memorable Congo safari experience.